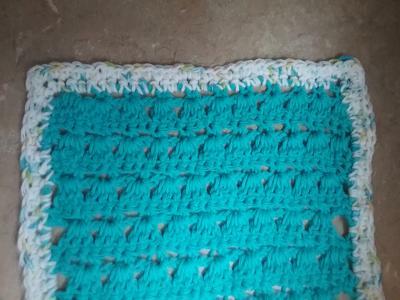 This stitch is a very versatile one and lends itself to many projects. Row 1: single crochet in 2nd chain from hook,*Chain 2, skip next 2 chain, single crochet in next chain*, repeat from *to* across, turn. 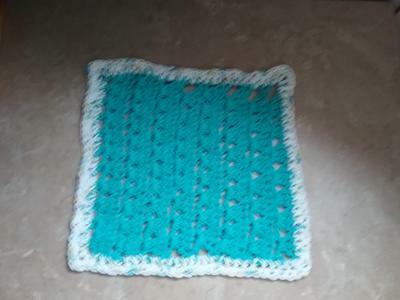 Row 2: chain 3(counts as first double crochet), double crochet in same beginning single crochet * skip next 2 chain, 3 double crochet in next single crochet *, repeat from *to* across to within last 3 stitches, skip next 2 single crochet, 2 double crochet in last single crochet, turn. Row 3: chain 1, single crochet in beginning double crochet * chain 2 skip next 2 double crochet, single crochet in next double crochet*, repeat from *to* across row ending by working last single crochet in top of ending chain 3, turn. 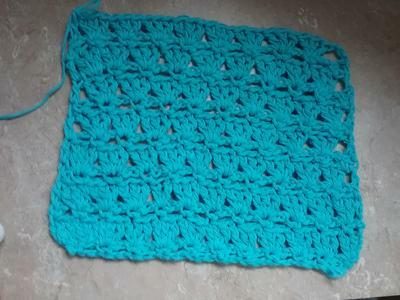 Edging: 2 rows of single crochet around the project.